This page describes how the Windows Hide File Extensions setting affects code in Excel. A file extension is a three or four character code, preceded by a period, that follows the proper name of a file. For example, the extension of a file named Book1.xls is xls. Windows uses the file extension to determine what program is to be used to open a file. The System Registry, a database of configuration data maintained by Windows, contains an entry for the xls extension that specifies that Excel is to be used to open the file. It is by the use of the extension that Windows knows to launch Excel, rather than, say, Word, to open an xls file. If you delete or change the extension of an existing file, Windows can no longer determine the appropriate program to launch when opening the file. This can render a file unusable if the user does not know what an extension is and how it is associated with a program. Because of this potential problem and perceived loss of data, Windows by default hides file extensions in Explorer windows. For example, the name of the file Book1.xls is displayed as Book1, without the xls extension. 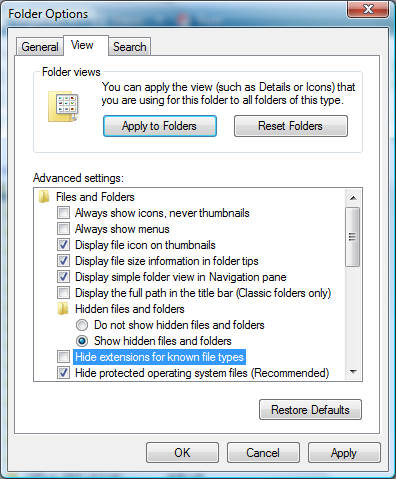 The hide extensions setting can be changed from the Folder Options dialog box available from any Windows Explorer window. The options dialog is shown below. It is worth noting that enabling the hide extensions setting to hide file extensions can make you more vulnerable to virus or trojan horse files. This is due to the way users behave, not to anything intrinsic to Windows. A virus writer may name a file SomeName.jpg.exe. If the hide extensions setting is enabled, the exe extension is hidden and the name of the file SomeName.jpg is displayed in Explorer windows. Most users know that jpg files are innocuous and, seeing the jpg extension, assume that SomeFile.jpg is a harmless image file. When the user clicks on the file to open it, Windows sees the exe extension and executes the program, unleashing potential destruction upon the unwary user. The hide extensions setting affects Excel and VBA code in two ways. First, it affects how you can refer to workbooks in the Workbooks object. Second, it affects how you can use the Caption property of a Window in a call to the FindWindowEx API function. to refer to the Book1 workbook. The second line of code above, without the xls extension, will fail with an error 9, Subscript Out Of Range, because there is no workbook with the name Book1. If the hide extensions setting is effect, you can omit the xls extension and use either of the following lines of code. These lines of code assume that you do not have open both an unsaved workbook with the name Book1 and a saved workbook with the name Book1.xls. With the hide extensions setting enabled (so that extensions are hidden in Windows), the two lines of code above are functionally equivalent. As a matter of good programming practice, you should always include the xls extension in a workbook name. This ensures that you reference the correct workbook regardless of the value of the hide extensions property. The second effect of the hide extensions setting is more subtle and can be much harder to debug if you don't know what to look for. Advanced level programming in Excel often makes use of the Windows Application Programmatic Interface (API) function libraries, and one of the more common API functions is the FindWindowEx function. This is used to find the window handle (HWnd) of a window, using the caption of the window as an identifier. The Caption property of a Window object returns the workbook name including the xls extension, regardless of the value of the hide extensions setting in Windows. For example, the Caption returns Book1.xls, not Book1, even if extensions are hidden and do not appear in the title bar of the window. This is done, I assume, to allow Excel to have separate open windows for an unsaved Book1, a saved Book1.xls file, a Book1.xlt template file and a Book1.csv CSV file. The string passed to the FindWindowEx function as a window text value requires that the file extension be removed if the Windows hide extensions setting is enabled. For example, if the hide extensions setting is enabled so that extensions are not displayed, a call to FindWindowEx using the window text Book1.xls will resuling with a No Window Found value. You must strip the xls extension from the Caption before passing it to FindWindowEx function. The code described on this page and available in downloadable module file includes a function named DoesWindowsHideFileExtensions that reads the registry value and returns TRUE if the hide extensions setting is enabled (extensions are hidden) or FALSE if the hide extensions setting is disabled (extensions are visible). The function takes no input parameters and returns simply TRUE or FALSE. The parameter W is a reference to an Excel.Window object, and the function returns the Caption value of the Window with the extension removed if necessary. where W is a reference to an Excel.Window object. The result of the function is the HWnd of the Window or 0 if an error occurred. The WindowHWnd function will work correctly regardless of the value of the hide extensions setting. You can download the modWindowCaption module here. The complete code is shown below.
' if the "hide extensions" setting is True.
' Windows "Hide Extensions" setting.
' just wrappers for the GetWindowText and GetClassName API functions. Private Const C_EXCEL_APP_CLASSNAME = "XLMain"
Private Const C_EXCEL_DESK_CLASSNAME = "XLDesk"
Private Const C_EXCEL_WINDOW_CLASSNAME = "EXCEL7"
' Open the registry key to get a handle (RegKey).
' Get the value of the "HideFileExt" named value.
' Close the key and return the result.
' the FindWindowEx API regardless of the value of the Windows "Hide Extensions"
' This returns the HWnd of the Window referenced by W.
' This just wraps up GetWindowText.
' This just wraps up GetClassName.